Welcome to Kuopio and Rauhalahti during the big events and the holidays. Many events have their own rates and holiday packages during major festivals (Easter, Midsummer, Christmas) are based in Finnish traditions and include all the best parts in programmes and meals. 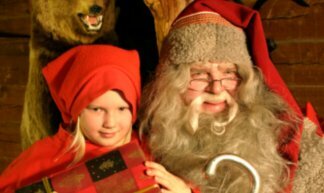 On Christmas Eve: Lunch of rice pudding; bathing in the smoke sauna; Christmas Eve dinner with entertainment and a visit by Santa Claus; a late-night cold buffet with Christmas ham from 22.00-24.00. On Christmas Day: A coach trip to a Christmas church service and a sightseeing tour. Lots of organised leisure activities for both children and adults. Check also our special offers for extra nights - they include halfboard and free use of sap and gym. Children under 4 years free of charge and children 4-14 yrs old pay 50 % of the adult's price. Single supplement 28 € / night in the spa hotel and 61 € / night in the apartment hotel.